Santa Clara County enacted its sanctuary policy in reaction to a federal immigration crackdown that resulted in unprecedented numbers of deportations. The kind that nearly separated Cecilia “Cecy” Chavez and her seven siblings from their father, who was handed off by local cops to U.S. Immigration and Customs Enforcement (ICE). The 2011 arrest in a neighboring county was part of a sweeping enforcement effort that earned then-President Barack Obama the moniker of deporter-in-chief. The ordinance implemented in Santa Clara County that same year in reaction to that national trend became a model for other jurisdictions. It also set the stage for the sanctuary state policy that became law eight years later in response to President Donald Trump’s even more draconian deportation machine. Senate Bill 54—the California Values Act signed in 2017 by former Gov. Jerry Brown—was hailed as the most progressive policy in the nation. Still, immigrant advocates like Chavez pointed to Santa Clara County’s as the standard-bearer for being one of the strongest in California. Under local rules, like the state’s, jailers must refuse “civil detainer requests” to hold inmates beyond their court-ordered stay unless immigration authorities submit a judicial warrant. Where the county policy goes above and beyond state law is by also prohibiting jail officials from telling federal officials about release dates of undocumented inmates—unless they were convicted of a serious or violent felony, as defined by state law. But like Kate Steinle’s killing did in San Francisco four years ago, the Feb. 28 stabbing death of 59-year-old Bambi Larson in her San Jose home and undocumented immigrant Carlos Eduardo Arevalo-Carranza’s arrest for the crime reignited debate over the landmark ordinance. Revelations that the 24-year-old El Salvador national was in the U.S. illegally and that Los Angeles and Santa Clara counties altogether eschewed nine civil detention requests from ICE renewed controversy over so-called sanctuary policies that critics blame for Larson’s murder. Now, a county long held as a national beacon for sanctuary policy will vote next week on whether to roll it back in response to public outcry over Larson’s slaying. Twenty-nine-year-old Chavez, who lobbied for the policy to protect families like hers all those years ago, is preparing for another battle. This time, however she’s on the defensive and part of a cohort of immigrant rights advocates called the FIRE Coalition. Ex-prosecutor and San Jose Mayor Sam Liccardo, his council colleague Johnny Khamis, Santa Clara County Sheriff Laurie Smith, District Attorney Jeff Rosen and every single police chief in the South Bay in criticizing the county’s policy of limiting cooperation with ICE. In a letter they co-authored last week, the coalition of law enforcement leaders implored the county Board of Supervisors to let local jails notify ICE about upcoming release dates for undocumented inmates accused or convicted of felonies or violent misdemeanors—something allowed by the state and barred by local law. “Contrary to other immigrant-focused initiatives that our agencies have supported, the existing policy that allows predatory criminals to evade lawful deportation requests makes everyone less safe,” Santa Clara County Police Chiefs’ Association President Max Bosel wrote in a March 21 letter to the Board of Supervisors that included a proposed policy outline mirroring SB 54. Last month, people who identified themselves as friends and supporters of Larson spoke at a Board of Supervisors meeting about the need for policy change to prevent similar tragedies. 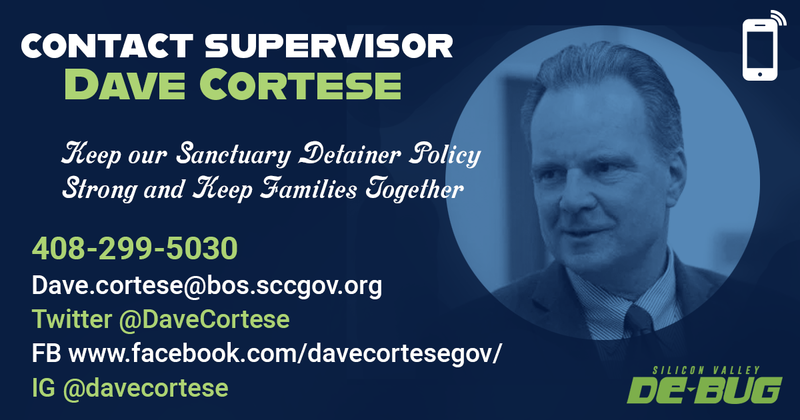 Supervisor Dave Cortese responded by submitted his own policy pitch urging local chiefs of police to figure out how to notify ICE about violent criminals who are also subject to civil deportation. That item comes up for board consideration next Tuesday. Indeed, ICE and its federal affiliates have access to some of the most sophisticated surveillance tools at any level of government and routinely taps into vast databases used by local cops. Through a multi-million contract with a private company called Vigilant Solutions, federal immigration officials have access to 5 billion records culled from private businesses and 1.5 billion data points from scores of local police agencies. Santa Clara County probation and other law enforcement officials already exchange information about release dates and other case information for immigrants with serious felonies to their name—as San Jose Inside has previously reported. While ICE arrests at California jails plummeted by more than 41 percent in the six months after SB 54 went into effect last year, a new report from the University of Oxford claims that it’s not for lack of available help from local authorities. According to the analysis co-authored by San Francisco-based pro-immigrant nonprofit Asian Americans Advancing Justice—Asian Law Caucus, 40 percent of police agencies statewide exploited legal loopholes to assist ICE and related agencies in violation of state sanctuary laws. Further, the study highlights conflicts between state and local policy and shows how a number of South Bay cities continued to rely on outdated duty manuals with provisions in violation of SB 54—whether or not they acted on those old policies. The Oxford University study claims that the San Jose Police Department continued allowing ICE agents to act as interpreters and commanding officers and to share the department’s facilities for immigration enforcement in the first part of 2018. It also says SJPD shared with ICE personal information about undocumented immigrants—all in violation of the California Values Act. SJPD Officer James Gonzales, the department’s community liaison, disputed those findings, saying no one working on the Oxford report bothered to contact the department to fact-check that data. “Once SB 54 passed, we stopped sharing the data, but our policy to not do anything related to immigration predated the law,” he says. “The important issue here is we shared some date with ICE prior to SB 54 and stopped when the law was passed but we did not engage in immigration activities or ask status prior to SB 54,” he clarified. San Jose PD says it has since revised its duty manual in response to SB 54. But law enforcement policies in Milpitas, Mountain View and Gilroy, among other local jurisdictions, appear to still violate the California Values Act. That is, according to Asian Law Caucus senior staff attorney Angela Chan, who co-authored the Oxford study and helped review some of the duty manuals obtained by San Jose Inside. The Mountain View police manual includes SB 54 carve-outs for, among other things, “traffic control and peacekeeping” that Chan says isn’t allowed under state law. Gilroy police seem to adhere to a manual with even more out-of-date provisions, Chan says, including including one that directs officers to notify ICE if an undocumented detainee is suspected of some type of drug offense—a clear violation of SB 54. In Milpitas, the manual has a couple potentially problematic passages, too, Chan says. While SB 54 prohibits officers from inquiring about a person’s immigration status, the Milpitas manual skirts around that by permitting cops to ask about citizenship. “Also, it’s unclear why [Milpitas PD] is training officers on how to identify a criminal immigration violation considering that SB 54 prohibits enforcement of both civil and criminal immigration law with one very narrow exception for illegal re-entry following deportation and conviction for an aggravated felony,” Chan adds. Those and several other potentially outdated manuals in the county have something in common, Chan notes: they each subscribe to Lexipol, a private company that provides policies for more than 3,400 public safety and law enforcement agencies in 35 states. In California, 90 percent of law enforcement agencies subscribe to Lexipol, making it the single most dominant force in police policymaking in the state and, according to a 2018 analysis of the company published in the Texas Law Review, in the entire country. Sold as a way to reduce liability by keeping policies attuned to the latest legislative updates, Lexipol’s policy updates can sometimes lag, Chan explains. For example, Brown signed SB 54 in October 2017 and the California Department of Justice didn’t issue guidelines for how to comply until March the next year. That left a five-month gap in which scores of local agencies turned to Lexipol. Palo Alto, which was one of the first California agencies to adopt Lexipol more than a decade ago, has adapted more quickly to legislation and case laws than the paid subscription service itself. That’s because the employs a full-time point-person to make sure the Palo Alto Police Department is as current as possible: Lt. James Reifschneider, who oversees personal and training for the agency and monitors policy changes on a daily basis. Yet Chan says the version of PAPD policy available online, though on its face more progressive than neighboring agencies, still includes outdated provisions. Reifschneider says that’s likely because the agency doesn’t update the document available to the public with as much regularity as the one referenced internally by officers. Lexipol can be a time-saver, he agrees, but used heedfully it’s also time-consuming. The cities of Santa Clara and Sunnyvale would be wise to follow Palo Alto’s lead. Santa Clara is in the process of switching over to Lexipol, while Sunnyvale became a subscriber around the middle of last year. The FIRE Coalition—short for Forum for Immigrants Rights and Empowerment—comprises several groups. Among them: Silicon Valley De-Bug, Services, Immigrant Rights & Education Network (SIREN), Sacred Heart and People Acting in Community Together (PACT). In a series of emails, its members have called on sanctuary policy advocates to call each of the five county supervisors ahead of the April 9 vote. The newsletter noted how the county has positioned itself at the forefront of the Trump resistance, and how sanctuary policies were a key part of that. It framed the opposition as in alliance with the president and his hardline stance on immigration. “But right now, racist, right-wing forces like Breitbart and Fox News are piling on, manipulating a heartbreaking tragedy in order to demonize all immigrants and undo Santa Clara [County]’s pro-immigrant policies,” the PACT message continued. Of course, Chavez says, not all who oppose the county’s sanctuary rules are rabid reactionaries. Many are simply devastated about what happened to Larson, who’s remembered as an animal lover, a baker and beloved 20-year member of the Thousand Oaks neighborhood, a product of local schools and 1983 graduate of San Jose State. “Don’t get me wrong, we do sympathize and are very saddened by the loss of life,” Chavez says. “We just shouldn’t change our policy based on one case.” Especially considering how peer-reviewed academic studies have shown time and again that undocumented immigrants are statistically less likely to commit violent crimes than their documented counterparts, she notes. The county has always honored judicial warrants obtained by ICE, Williams emphasizes in an email this week to San Jose Inside. Indeed, detaining a person—citizen or otherwise—without such a warrant opens up the county to legal liability.